O'Moore Park in Portlaoise is unplayable today. THE WEATHER HAS caused havoc with today’s GAA schedule as four AIB All-Ireland club semi-final ties have been postponed with the O’Byrne Cup decider between Meath and Westmeath also called off. Pitch inspections had been organised this morning due to the forecast for heavy rains in the Midlands. 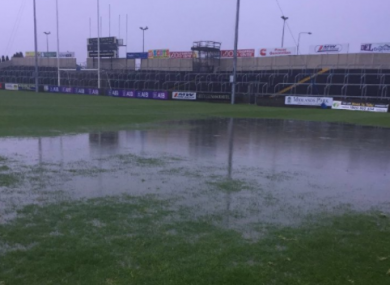 O’Moore Park in Portlaoise – which was set to hold a double-header – Páirc Tailteann in Navan, St Conleth’s Park in Newbridge and Bord Na Móna O’Connor Park in Tullamore were all deemed unplayable. Refixture details to be announced tomorrow. Refixture details will be announced tomorrow but the postponements will cause a headache for GAA officials ahead of the finals in the club championships on the weekend of 3-4 February in Croke Park. Four semi-final ties did take place yesterday in the club championship with Cork’s Knocknagree and Westmeath’s Multyfarnham setting up an All-Ireland junior football final meeting. St Patrick’s Ballyragget from Kilkenny qualified for the intermediate hurling decider and Wexford club St Mogue’s Fethard reached the junior hurling final. Turning back heading home!Portlaoise unplayable. Families all down yesterday. Tough on entire club. Could Croke Park have been used? Several camogie league fixtures have also been called off including the meeting of reigning All-Ireland champions Cork against Wexford. Email “Heavy rain sees 4 All-Ireland club semi-finals and O'Byrne Cup final postponed”. Feedback on “Heavy rain sees 4 All-Ireland club semi-finals and O'Byrne Cup final postponed”.